Our arrival in Eureka Springs, Arkansas was not met with grand fanfare. Actually, we just slid in down Main Street, and located a parking spot near downtown. After a drive filled with exploration, the first thing on our minds was lunch. 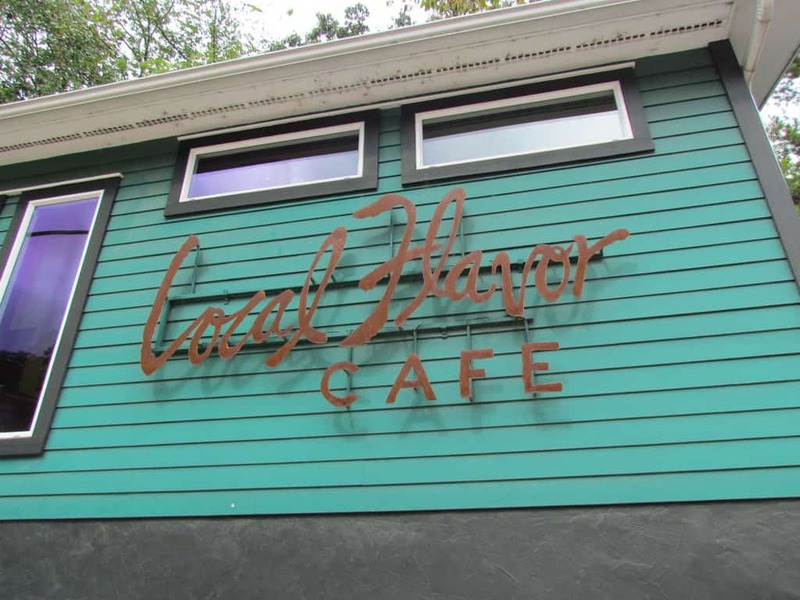 We had polled our readers for restaurant ideas prior to our departure, and Local Flavor Cafe came up numerous times. It was clearly popular with most of you, so we knew it should be a good visit. 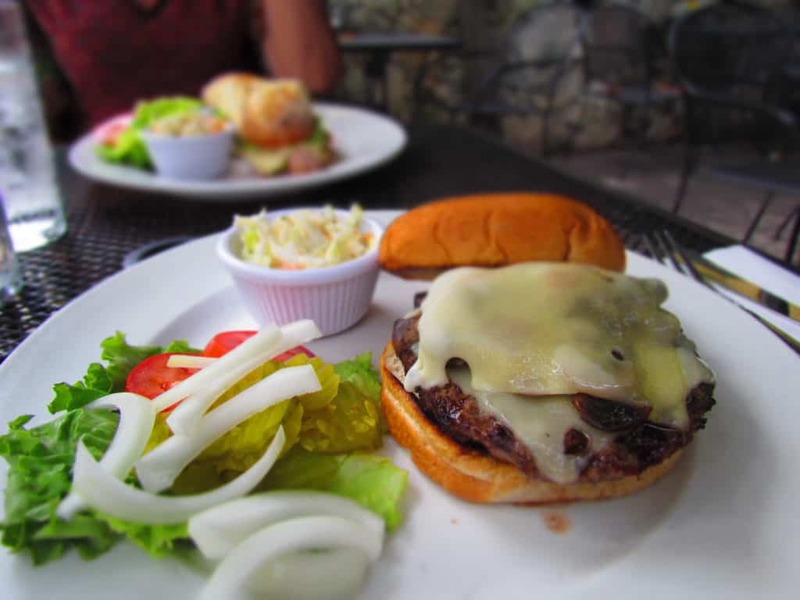 This restaurant has been a staple on the Eureka Springs scene since 1991. Owned and operated by chef Britt Evans, we had high expectations for our meals. We had viewed the menu during the planning stage, and saw that Local Flavor Cafe had an eclectic mix of dishes. Many of these have interesting sounding flavor combinations. The restaurant is located on the main drag through town, so it is easy to locate. 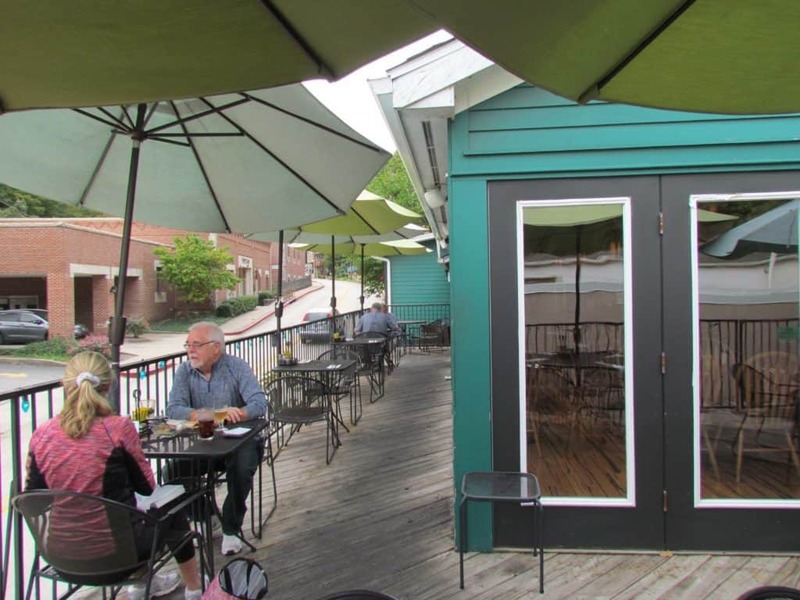 It sits on a hillside overlooking the street, and offers indoor and outside seating options. They have a nice balcony area, but we chose to sit in a cozier grotto type section, which is also outdoors. As usual, I popped inside to get a feel for the seating arrangement. 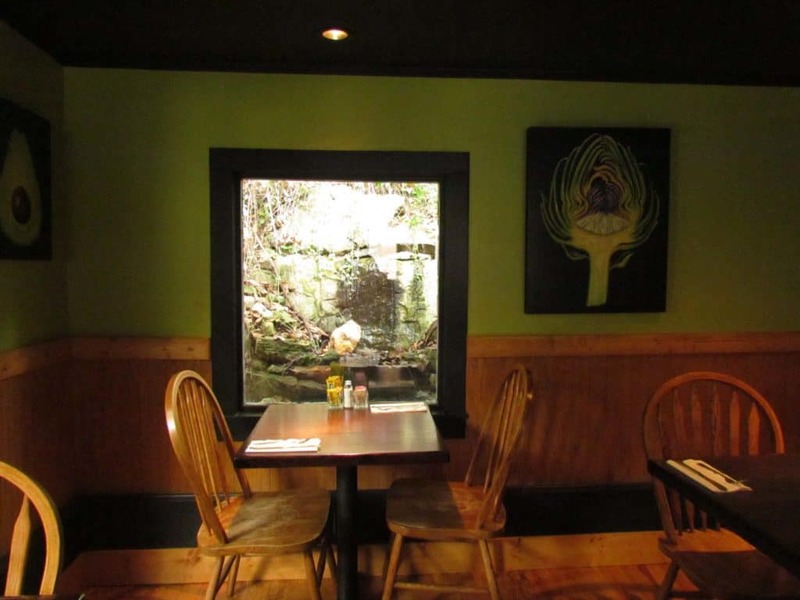 The place is very low key casual, and they have a seating area that offers a delightful view of a local spring. That is certainly something we forget about in between trips to Eureka Springs. It seems we are always surprised by the amount of running water in and around this town. The staff were caught off guard by my camera, but once I explained they relaxed, and were extremely accommodating. Blogging is certainly a great way to meet people, and a good conversation starter. After all, just about everyone likes to travel, so it’s easy to have something in common. I headed back to the table, and we ordered our meals. While we waited for our food we observed how tranquil the setting was around us. Even though some of the tables were filled, we still felt like we had as much privacy as we wanted. Before long our food arrived, and we arranged the plates on our table. Obviously, I had to take pictures first, and fortunately Crystal has become accustomed to this protocol. Once the formalities were completed it was time to dig in. I was in a beef eating mood, so I decided to sample one of their burgers. There were two or three on the menu that piqued my interest, but I finally settled on the Mushroom Swiss Burger. I am a huge fan of mushrooms, and this sandwich had an ample supply. The condiments and accessories all arrived on the side, which makes it easier to assemble the sandwich to your own liking. The burger was moist and juicy, and they used a good quality Swiss cheese. Everything blended together in each bite to create a pleasing flavor. The meal comes with a side of their homemade Cole slaw, which had a nice tangy taste without being too sweet. Crystal went with the sandwich that I already knew she would pick, the Turkey Avocado Pepper Jack. It’s almost a certain bet that if a menu item calls out avocado in the title, then she will gravitate toward it. This also explains why we find ourselves testing the guacamole at so many restaurants. 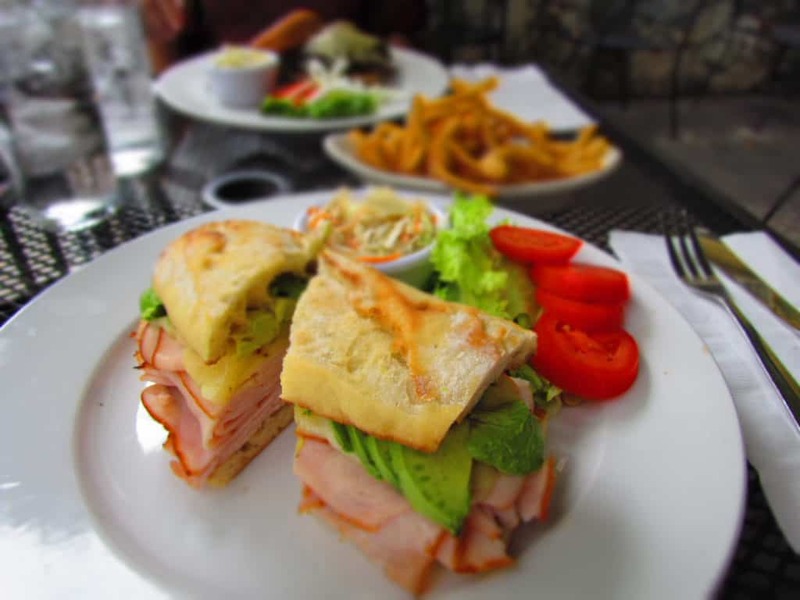 This Local Flavor Cafe favorite has a good amount of sliced turkey piled on a sourdough roll. The meat is topped with pepper jack cheese, as well as a generous amount of avocado. This dish also comes with a side of the slaw, and we tossed in an order of the french fries to boot. She enjoyed the freshness of the ingredients, as well as the flavor combination. By the end of the meal our hungers were quenched. Now it was time to get back to exploring. 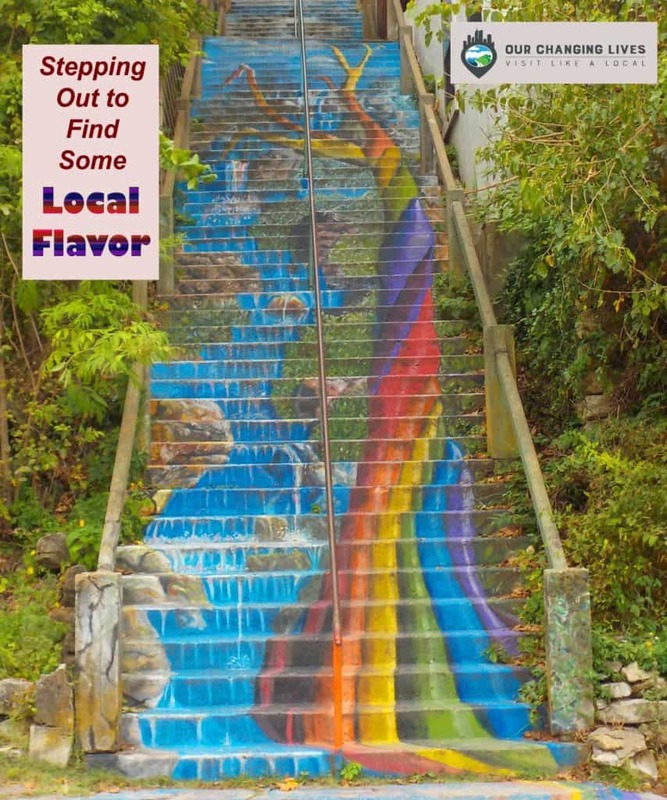 Jeff and Crystal we are enjoying your articles on Eureka Springs. We met you last fall and we are the couple in your picture at Local Flavor. Finally got around to checking out your site and we are jealous of your business! Let me know if you franchise! Thanks for finding us. We remember you, and are glad you allowed us to use your pic. I will be sure to clue you in if we expand, but for now we are just holding on through this winter weather. Don’t be strangers. Come back and visit us.